Ejecta structure of our GCD model at 60s past explosion. Burning products from the off-centre ignited detonation (indicated by the blue surface) are engulfed by deflagration ashes (shown in red and rendered semi-transparently to allow to see the detonation ashes). 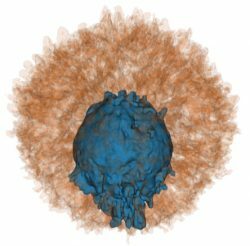 The gravitationally confined detonation (GCD) model has been proposed as a possible explosion mechanism for Type Ia supernovae (SNe) in the single-degenerate evolution channel. Driven by buoyancy, a deflagration flame rises in a narrow cone towards the surface of the exploding white dwarf star. For the most part, the flow of the expanding ashes remains radial, but upon reaching the outer, low-pressure layers of the white dwarf, an additional lateral component develops. This makes the deflagration ashes converge again at the opposite side, where the compression heats fuel and a detonation may be launched. To test the GCD model, we perform a 3D explosion simulation for a model with an ignition spot offset near the upper limit of what is still justifiable, 200 km. This simulation meets our deliberately optimistic detonation criteria and we initiate a detonation. The detonation burns through the white dwarf and leads to its complete disruption. We determine nucleosynthetic yields by post-processing a million tracer particles with a 384 nuclide reaction network and we present multi-band light curves and time-dependent optical spectra. We find that our synthetic observables show a prominent viewing-angle sensitivity in UV and blue bands, which is in tension with observed SNe Ia. 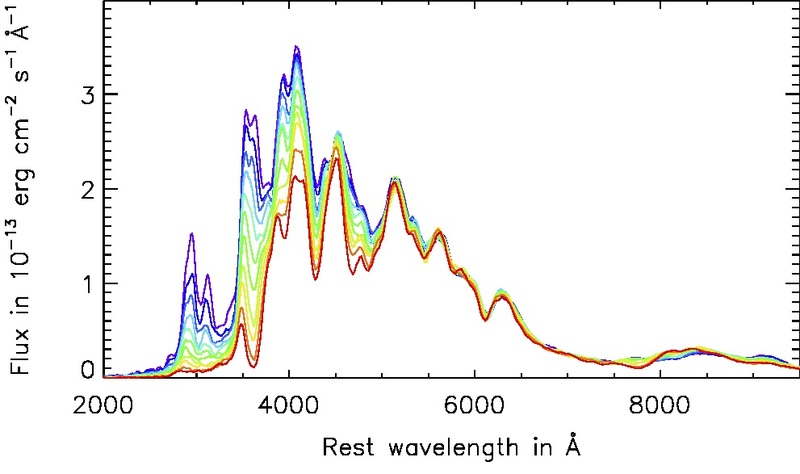 Synthetic spectra of our GCD model at around maximum light. The asymmetry of the ejecta imposes a strong viewing-angle sensitivity at at short wavelengths. The strong dependence on viewing-angle is caused by the asymmetric distribution of the deflagration ashes in the outer ejecta layers. Finally, we perform a comparison of our model to SN 1991T. The overall flux-level of the model is slightly too low and the model predicts pre-maximum light spectral features due to Ca, S, and Si that are too strong compared SN 1991T. We therefore find it unlikely that the GCD model can explain SN 1991T or similar SNe. This entry was posted in Research by mkromer. Bookmark the permalink.